“She is the only woman in the world who raised twin astronauts. She raised two sons, not just brothers but twins, who flew up into the heavens." Officer Patricia Kelly was a trailblazer. As the first female police officer with the West Orange (NJ) Police Department, she was adept at breaking up bar fights while working the midnight shift and raising twin sons at home. At just 5 feet, 4 inches tall, her family called her fearless — and they should know. Sons Mark and Scott Kelly, identical twins, both blazed their own trails as NASA astronauts. Her husband Richard was a Navy paratrooper who later became a West Orange (NJ) police officer working alongside his wife. Kelly was assigned to patrol with Harry Phillips, who went on to become Executive Director of the Police Unity tour. Scott Kelly recalled his mother was the first woman to pass the men’s physical fitness test. “Patty” Kelly cleared a makeshift blockade of more than seven feet tall in four and a half seconds, earning her a spot as West Orange’s first female police officer. When daughter-in-law U.S. Representative Gabrielle Giffords was shot at an Arizona campaign event in 2011, Mark Kelly says it was his mother who stayed by her side while she recovered. Born the oldest of four children in New York’s Bronx borough, Kelly married when she was 20 years old. 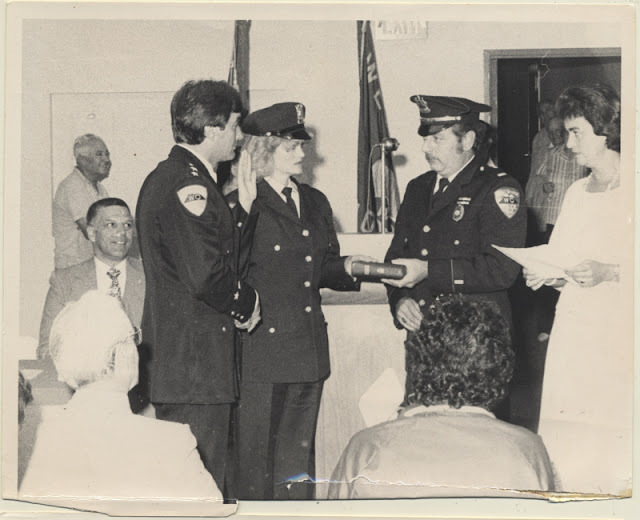 In addition to her ten years of service with the police department in West Orange, Kelly was also a prison guard, an Essex Park County (NJ) police officer and served with the Flagler Beach (FL) Police Department before an injury prompted her to retire and move to Texas to be near her grandchildren. Patricia Kelly died in April 2012 of lung cancer but left a lasting legacy as an exceptional person both on the job and off.